NC Mountain Vacation Cabins for rent - Activities - Cabin for rent near Nantahala Outdoor Center White Water Rafting, Appalachian and Bartram Trail - Nantahala NC Swain County. Lake Nantahala lakefront Vacation Cabins for rent near the Nantahala River White Water Rafting. Southwestern North Carolina lake and river vacation rentals. Western NC vacation homes and log cabins for rent. Vacation homes for rent in the South West North Carolina Mountains. Cabin rentals on Lake Nantahala and the Nantahala river. 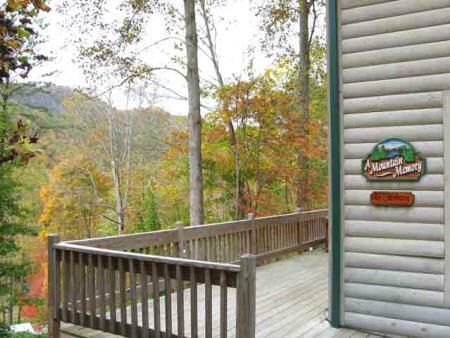 Cabins for rent close to the Great Smokey Mountains. may be the only city name that is not spelled "Ashville". Short drive from Great Smoky Mountains National Park, Blue Ridge Parkway, spectacular waterfalls, antique and Appalachian craft shopping, Smoky Mountains Country Club Golf Course in Whittier, skiing at Cataloochee, horseback riding, whitewater rafting, hiking, mountain biking, & kayaking on the Nantahala River. Ride the Great Smoky Mountains Railway from the Bryson City or Dillsboro depots. Stay near the Cherokee Indian Reservation and shop for Native American Indian crafts. Appalachian Trail, Biltmore House and Gardens, Blowing Rock, Cherohala Skyway, Cherokee Bear Zoo & Exotic Animals, Cherokee Indian Museum, Cherokee Indian Reservation, Soco Gardens Zoo, Tribal Bingo, Harrahs Casino. Shopping in Asheville, Gatlinburg, Pigeon Forge, Cherokee, Dillsboro, Maggie Valley. Chimney Rock Park , Mt. Mitchell State Park, Gold City Gem Mine, Ghost Town in the Sky, Maggie Valley, Road to Nowhere in Bryson City, Smoky Mountain Jamboree in Maggie Valley, Cradle of Forestry, Fontana Dam, Deep Creek Tubing in Bryson City, Fields of the Wood, pontoon boating on Fontana Lake and Dam, Great Smoky Mountains National Park. Great Smoky Mountains Railway from Nantahala River Gorge, Bryson City or Dillsboro. Joyce Kilmer Memorial Forest, Linville Caverns, Mountain Farm and Museum at Great Smoky Mountains National Park Oconaluftee Visitors Center, Nantahala National Forest, Nantahala River rafting, Oconaluftee Indian Village, Pisgah National Forest, Santa's Land in Cherokee, Smoky Mountain Country Club in Whittier, Soco Gardens Zoo, Tribal Bingo, Harrahs Cherokee Casino, Tsali mountain biking and horse riding, Unto These Hills Drama in Cherokee, Darnell's Corn Maze in Bryson City. Skiing and snowboarding at Cataloochee Ski Area. Snow tubing at Cataloochee Ski Area and Scaly Mountain snow tubing. So much to do and not enough time to see it all! 'A Mountain Memory' is a quiet, secluded two bedrooms, two baths, cabin with easy access to the Nantahala River. This cozy cabin features a rustic decor with pine paneled cathedral ceilings and wood floors. Relax in the hot tub spa and enjoy the peaceful surroundings on the large deck and the private picnic area and outside grill. Escape to the mountains for Nantahala River whitewater rafting, Nantahala River trout fly fishing, mountain biking and hiking, while enjoying all the conveniences of home. This cabin is perfect for a honeymoon or anniversary with its cozy fireplace stove and romantic Jacuzzi in the loft; the spaciousness of the cabin makes it also perfect for a small family. Entertainment amenities include a four person hot tub spa on the deck, a large screen TV with Directv satellite system, DVD and VCR player. This Vacation Rental Cabin is near Nantahala River Gorge White Water Rafting, Nantahala Outdoor Center, Lake Nantahala and Nantahala River trout fly fishing, USFS Tsali Recreation Area Mountain Bike Trails, Appalachian Trail hiking, Joyce Kilmer Memorial Forest, Lake Fontana and Fontana Dam, Great Smoky Mountains National Park, Cades Cove, Blue Ridge Parkway, the Great Smoky Mountains Railroad Excursions Train, Cherokee Indian Reserve and Harrah's Casino in Cherokee. Only a scenic 1 1/2 hour excursion to Asheville NC and Biltmore House Estate. Vacation homes for rent in South Western North Carolina. Vacation homes for rent by owner. Vacation cabin rentals on, near the nantahala river. Vacation house rentals. Romantic vacation cabin with Jacuzzi for rent. Honeymoon vacation cabin with Jacuzzi for rent. Southwestern North Carolina Vacation cabin rentals with hot tub. Water lakefront vacation home for rent in Georgia and North Carolina. Vacation cabin rentals with hottub. Vacation cabin rentals near the Nantahala Outdoor Center NOC, Appalachian Trail, Bartram Trail, Bertram Trail. Southwest North Carolina vacation house rentals with hot tub, spa, North Carolina travel, north carolina tourism, north carolina vacation, asheville north carolina, ashville north carolina, boone north carolina, cherokee north carolina , blowing rock north carolina, franklin north carolina, brevard north carolina. whitewater rafting in north carolina, tennessee whitewater rafting, nantahala white water rafting, nanthala, nantehala, nantahale, nantala, nantahala river kayak, nantahala rafting, nantahala national park, ocoee river rafting, white water rafting, nantahala outdoor center, nantahala national forest, nantahala river lodging, great smoky mountains cabin rentals, cabin smoky mountains. mountain vacations of north carolina, smokey mountain vacations, north carolina mountain vacations. georgia mountain vacations, smoky mountain vacations. Gatlinburg cabins, gatlinburg cabin rentals, pigeon forge cabins and gatlinburg mountain cabin rentals. Tasli mountain bike trail.